Mariah Carey has one of the most well-known voices in the world, but even her most diehard fans — or should we say "lambs" — may have a difficult time identifying her signature pipes when she guest-stars on American Dad. 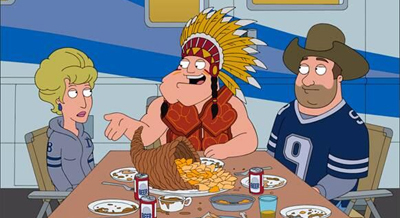 On Sunday's episode, Carey plays a Texas native named Laura, who invites Stan to join her and her husband's Thanksgiving football tailgate when his own turkey day festivities don't go as planned. But will Laura's major grill emergency thwart their plans for a delicious meal? Not if Stan can help it! Watch this sneak peek to hear Carey's Southern twang.